Chang's analyis found that in the Optimistic case, the direct annual cost of AB 32 grows at an average rate of 37% annually and amounts to $35.3 billion in 2020. Perhaps not surprisingly, an association representing Californnia's manufacturers has found that the implementation of California's new cap and trade program at the beginning of the year is going to put a big hurt on the state's economy, business and consumers. The California Manufacturers and Technology Association's just issued report, prepared for the association by research firm Andrew Chang & Company, says the law will cost consumers and businesses billions of dollars annually, and that much of the reduction in greenhouse gas emissions will be the result of slowing growth or businesses leaving the state. In 2006, the California legislature signed the law, known commonly as "AB 32" in the state, mandating a cap and trade regime for greenhouse gas emissions and other new environmental regulations. It then survived a statewide vote in 2010 that would have delayed implementation of the law until the economy in the state was on better footing. In the fall of 2011, the state issued its final rules for the cap and trade program, which then began at the start of 2012. The first phase includes 650 of the state's largest factories and utilities. In 2015, fuel distribution will begin to fall under the cap and trade program, which will greatly expand its reach. (See Details of California's Cap and Trade Plan Released.) The law mandates that the state reduce its carbon emissions to 1990 levels by 2020. The California Air Resource Board (ARB) has completed a couple of studies on the economic impact of AB 32, the second of which found in 2010 that the law would reduce the state's GDP growth by just .2% per year. However, the new report says that new data that subsequently became available shows the impact will be far greater than the ARB estimate - though how much as always depends on the assumptions used. Chang & Co. developed three scenarios relative to the cost of credits, alternative fuel production, how aggressively portions of the law related to "sustainable" housing plans in the state are enforced, and other factors. That includes Low, Optimistic and High scenarios relative to the potential cost and economic impact. For example, under the Low scenario, the cost to purchase a carbon credit in the state exchange is $25.00. That rises to $50.00 under the Optimistic scnario, and $100.00 under the high scenario. Chang then calculated the direct costs to California's economy for each scenario by estimating the resulting rise in commodity costs in the state, the cost of required technological changes and the cost of cap and trade compliance credits and offsets, reduced by direct savings in the form of decreased demand for commodities as prices rise. Chang's analyis found that in the Optimistic case, the direct annual cost of AB 32 grows at an average rate of 37% annually and amounts to $35.3 billion in 2020. That amount of money is equivalent to about 40% of California’s General Fund revenues, and exceeds the General Fund collections for Sales and Use Tax, Corporation Tax, Motor Vehicle Fees, Insurance Tax, Estate Taxes, Liquor Tax and Tobacco Tax combined. By comparison, the direct cost estimate in 2020 for the Low scenario is about $16 billion, and as much as $65 billion for the High cost scenario. Chang also estimates California's Gross State Product (GSP) will take a hit. "AB 32 lowers the projected 2020 GSP from $2.722 trillion to only $2.569 trillion, a loss of $153.2 billion in 2020," the report says, under the Optimistic scenario. "This amounts to a loss of approximately 5.6% of GSP in the year 2020. This lost percentage of GSP is roughly equivalent to California’s real GSP loss in the Great Recession from December 2007 to June 2009." That reduced growth in GSP would lead to a loss of 260,000 jobs in the state in 2020, Chang concludes. Finally, Chang estimates that increased energy and transit prices will increase household expenses for the average California family by $2,500 per year. This is nearly two and a half times the monthly mortgage payment made by an average California family. When combined with the lost earnings, AB 32 will cost the average California family almost $3,400 per year, the report says. The report says that the law will have a large impact on greenhose gas emissions, finding that AB 32 will cumulatively reduce 648 million tons of GHG through 2020. 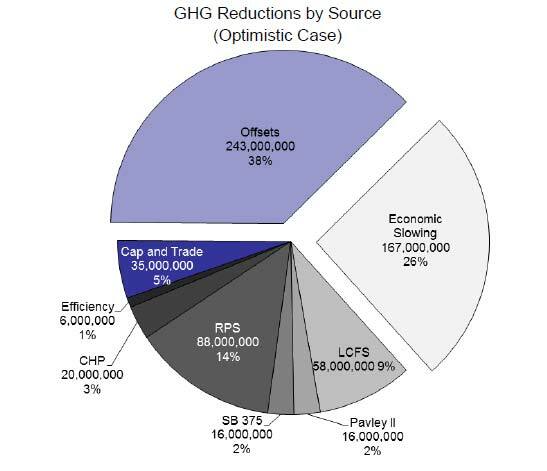 As shown in the graphic below, the largest single share of those emission declines will come from a facet of the cap and trade program, the ability of company's to purchase "offsets" for their own emissions for projects that will reduce emissions elsewhere. California's law set fairly stringent conditions for these offsets, such as that the projects (tree plantings, for example) have to be within the United States, not across the globe as Europe's offset system allowed. But the second biggest share of the total GHG reductions, at 26% of the total, comes from the reduction in economic activity in the state. The actual costs to buy permits, thus incenting GHG abatement measures, drives down emissions by just 5% of the total. The only other element of AB 32, which include,Low Carbon Fuel Standard (LCFS), Pavley II Fuel Efficiency Standards, SB 375 (which has to do with how cities are allowed to grow), the Renewable Portfolio Standard (RPS), and Combined Heat & Power (CHP), to have a major impact is the RPS requirements for mandating a certain percent of energy in the state be produced from renewable sources (14% of the total decline). "At this critical junction, policy makers should consider if there are more cost-effective solutions that may produce the same GHG reductions," the report concludes. "As noted, AB 32 has a balanced mandate to produce cost-effective solutions. However, despite the considerable amount of research that has been produced or commissioned by ARB, no study has comprehensively assessed whether ARB’s plan is indeed cost-effective. Because of the potential harms and benefits that could emerge, policy makers should explore this issue in greater detail." The Wall Street Journal editorial page was quick to observe that "Enivornmentalists dismiss these studies as biased, but they echo the governments own recent studies. The only real argument is over the extent of the economic damage. Californians may believe this price is worth it, but they shouldn't pretend they aren't paying it." Clegern also said the study did not factor in the public health benefits from cleaner air, which he estimates will save the state about $4.3 billion in health care costs in 2020. Regulations requiring cleaner running cars will save Californians $5 billion in gasoline in 2025 and $10 billion on 2030, he said. Environmentalists also say the new rules will drive investment in green technologies that will spur economic growth. A link to the full report can be found here: The Fiscal and Economic Impact of the California Global Warming Solutions Act of 2006. What do you think of this report and its conclusions? Is the Manufacturers Associaton right about the impact - or the ARB? Are there better ways to reach the goals, as the report suggests? Let us know your thoughts at the Feedback button below.